It’s been really fun reading everyone’s Fourth of July recaps (well, from the American bloggers at least)! Like everyone else, I had a wonderful long weekend off of work and realized, while lazing around on Monday, that I could use a long weekend almost every weekend. It seems that it takes two days off to really start to relax. Anyone else feel that way? While I relaxed on Monday, Saturday was a jam-packed day of beer & wine festivaling it up the mountain in Floyd. Fandango, the beer & wine fest, falls every Independence Day weekend and features wine and beer and music and camping. What more could you ask for? I intended to actually take pictures and blog about the day, but I ended up drinking more than anything. I mean, that’s what I was there for, right? (smile) But lack of pictures aside, it was a beautiful day and heaven bless the wine tables where wineries gave full tastings to very drunk groups of people. Sunday, G & I headed back to town semi-early and worked on things at our houses a bit, but Monday was a day to relax and relax some more and relax some more. I cooked breakfast and caught up on everyone’s blogs and lazed on the couch and, eventually, when we got hungry, we decided to grill up some bacon-wrapped hot dogs. 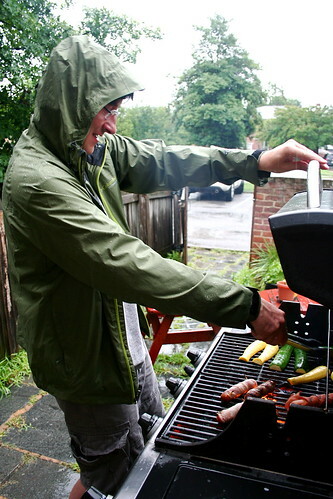 Never mind the fact that it was pouring rain–that certainly didn’t deter G.
We didn’t have the goods at the house, so we grabbed some things at Kroger and fired up the grill. Feeling a wee bit more like not eating meat, I decided to go the vegan route and see how good it could be. I’m not thrilled about the Smart Bacon (had never eaten it before, actually) and I wish I’d had more time and ingredients on hand to make my own sausage, but the store-bought Tofurkey one did right fine. 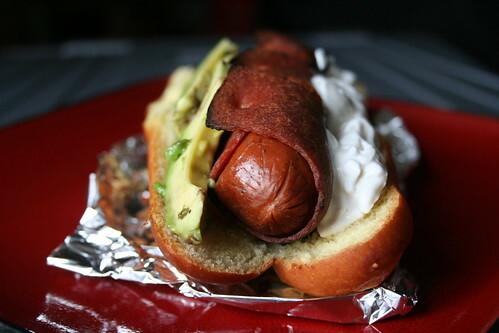 Vegan sour cream and slices of avocado, and, voila, a vegan bacon-wrapped hot dog (sausage) with avocado and sour cream! 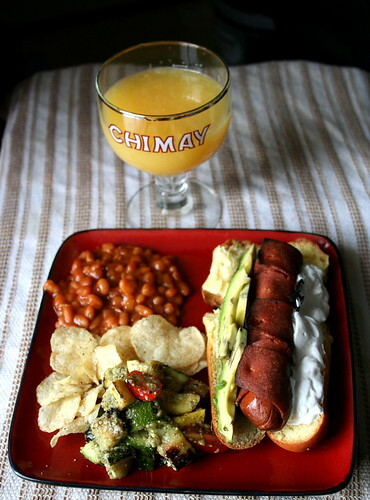 Definitely satisfying–especially with the veggie beans from a can (I know, I know, I know…), salt & pepper potato chips, the grilled pesto squash salad thing (recipe to come), and my mimosa in a Chimay glass (tres American)! Wrap the uncooked vegan sausage/hot dog with the uncooked vegan bacon (I used toothpicks to hold the bacon onto the sausage). Grill for 3-5 minutes, until hot and slightly charred. Grill hot dog bun for one minute, until toasty. Put bacon-wrapped sausage/hot dog in bun, layer one side with avocado slices, slather the other with the vegan sour cream. OMG I’m dying! This looks like my dream-hot dog!!!! What an awesome 4th recipe. I am adding you to my blog roll. I’m not a huge fan of smart bacon either, I like it better in stuff. Still looks like a great plate! That is truly and entirely crazy. And that’s why it seems so delicious, I’m sure! Meatless bacon hot dogs… It’s a wonderful time to be a vegan! That’s awesome! I grilled a veggie dog wrapped in bacon last summer but yours looks better than mine. I also never thought of avocado and sour cream as condiments. Good job! OMG! That looks so awesome! what a perfect 4th of July meal! Your hot dog pictures always make me intensely crave a hot dog. Seriously, my mouth is watering right now. This looks delicious, Jes, and vegan, too. I like the Fakin’ Bacon, but never tried the Tofurkey. I enjoy all your traveling stories and food stops. Enjoy it while you can, Jes. Sometimes when you stand still, it’s hard to get moving again!